Get connected— T-Mobile is offering one of 2015’s hottest smartphones for free! Get a 32 GB Samsung Galaxy S6 — which usually sells for $580 or $24 a month. — for $0 down and $0 a month for 18 months. Click here for more details. Upgrade your system— Are your computers outdated? Dell’s got deals on everything from laptops to desktops. In fact, you’ll find the lowest prices ever on Dell.com. Best of all, the sale starts today! Study up— No matter what industry you’re in, there’s always something new to learn. Online education marketplace Udemy is offering up to 90 percent off online courses aimed at helping you improve yourself and your business. Think of it as an investment in your (well-educated) future! Promote your brand— Everybody loves swag. Promotional products company Motivators is offering 10 percent off branded items this Black Friday. Add your logo to popular products like bags, corporate gifts and calendars to help spread the word about your business. 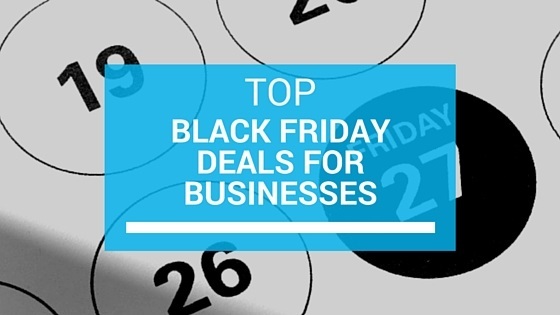 What other Black Friday deals for businesses have you spotted? Share your ideas with RMP Capital on Facebook and Twitter! For unique funding solutions, give us a call at 631.738.0047.